IoT sensors tend to be very low powered devices. I’ve had most success recently with the Particle boards and the Esp8266 chips. The ESP chips are cheaper, but a little rougher on the edges. Both of these feature 32-bit microcontrollers with WIFI capability built-in. Since I wish to eventually deploy several of these throughout my yard and run them on batteries, power use is a huge concern. They can run as TCP servers or clients, but to be in an always listening state is a recipe for power drain. It’s better to deep-sleep most the time and wake up on some interval, measure the environment, and report the data to some other machine. For now we’ll assume there is some service running on the lan that accepts sensor data and records it for us. This way the code in the microcontroller can be very simple and spend most it’s time sleeping. This microcontroller above is a Spark Core with a single LDR sensor measuring ambient light. I wish to report this data to the relay server. The monitoring agent works by polling the system on a schedule, not by listening for events to get pushed to it form the system. This is obviously not a good match for the sensors that need to fire and forget their data to save their precious battery life. We will create an in-between process using luvit that listens for data from the field and reports it to the agent on demand (listening two ways). First we need to create a TCP server that listens for sensor reports from the field. It will buffer this data in memory and wait for the agent to ask for it. -- Wait for more data if not. -- Move line from buffer to log list. What interface should we now expose to the monitoring agent? At first I thought to use another TCP service, but it’s fun to write agent plugins in shell. TCP clients aren’t easy in bash, but dumping the contents of a unix socket is trivially cat /path/to/socket or socat - UNIX:/path/to/socket depending on your OS. To create the socket, we use the same coro-net library, but with a string path. 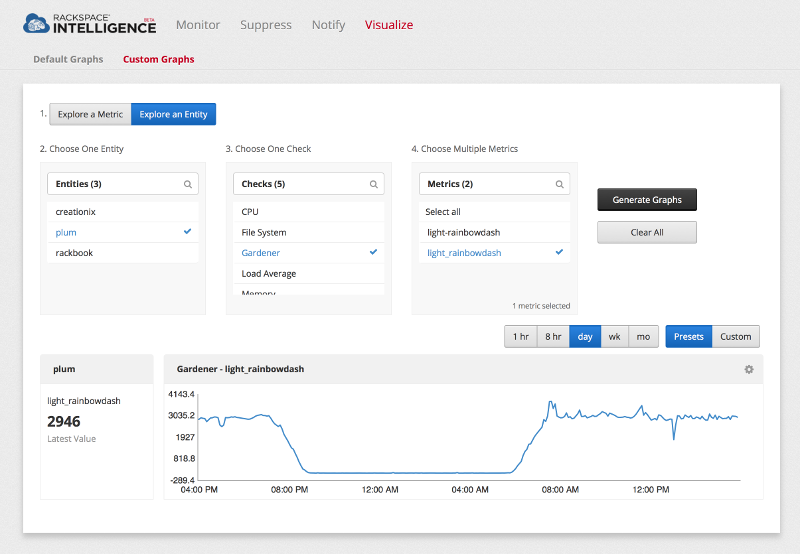 The rackspace monitoring agent is also running on this machine. When it connects it’s told the schedule to poll the plugin. It then reports the data up to the processing pipeline and we get a pretty graph showing data. This particular metric is the light sensor on my office window-sill. You can see the time the sun rises and sets. I purposely left out some details to keep this readable. If you wish to see the full source code with error handling and data validation, check out my gardener project on github. If you have questions about the rackspace side of things like how exactly to create the entities and checks, I used the raxmon tool. Also the monitoring system has a fully featured alarms system that allows sending out emails or other alerts based on watches for certain conditions. 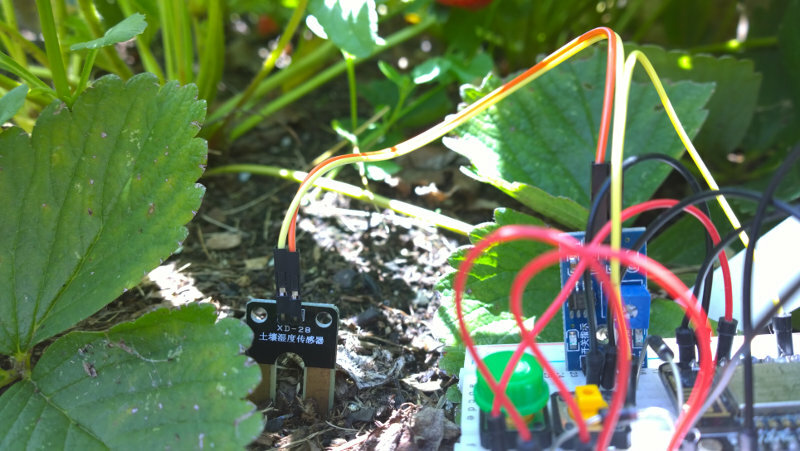 I could have a moisture sensor in my garden send me emails when it’s time to water the garden, for example.